Chlorine trifluoride (which I will subsequently refer to as ClF3) is one of the most reactive oxidising compounds known. Chlorine and fluorine are nasty enough by themselves, but at least in normal conditions they bond with themselves in diatomic molecules, which reduces their hunger for electrons of their neighbours. Not so with ClF3: it is a cluster of fiercely electronegative atoms which, at the moment they're released from their bonds, will attack anything in their vicinity. 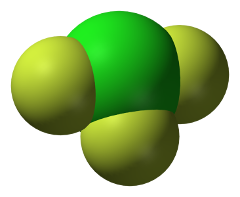 Chlorine trifluoride, ClF3, or “CTF” as the engineers insist on calling it, is a colorless gas, a greenish liquid, or a white solid. … It is also quite probably the most vigorous fluorinating agent in existence—much more vigorous than fluorine itself. … It is, of course, extremely toxic, but that's the least of the problem. It is hypergolic with every known fuel, and so rapidly hypergolic that no ignition delay has ever been measured. It is also hypergolic with such things as cloth, wood, and test engineers, not to mention asbestos, sand, and water—with which it reacts explosively. It can be kept in some of the ordinary structural metals—steel, copper, aluminum, etc.—because the formation of a thin film of insoluble metal fluoride which protects the bulk of the metal, just as the invisible coat of oxide on aluminum keeps it from burning up in the atmosphere. If, however, this coat is melted or scrubbed off, the operator is confronted with the problem of coping with a metal-fluorine fire. For dealing with this situation, I have always recommended a good pair of running shoes. Now, a group of utterly mad French chemists have demonstrated in a video what happens when this compound interacts with substances normally considered as shields against chemical adversities, including Plexiglas, a gas mask, and rubber gloves. For more details on this savage molecule, see “Sand Won't Save You this Time” on In the Pipeline. It is actually used in the semiconductor industry to clean chemical vapour deposition chambers. Hey, at least it isn't FOOF!